I don’t remember the first time I heard Bruce Springsteen’s music. I’d love to tell you I recall those first few notes of “Thunder Road”, that the opening lines of that song changed my life that day. But that would be a lie. Years ago, my dad was the serious Springsteen fan. In the 1970s, he went to see Bruce Springsteen play in London. He was nursing a broken leg at the time, but soon forgot about his pain as he balanced on a chair, one leg in a cast, waving his crutches in the air to one of Bruce’s liveliest songs, “Rosalita”. All through my childhood Springsteen was strumming his guitar in the background, rocking me to sleep and making long car journeys fun. Now – as an adult – I go “on tour” to see him play. I queue for days so I can watch from the first few rows, while my dad will happily arrive a few hours before the start, and take his seat in the stands. From wherever you are in that stadium, Bruce will ensure you feel a connection to him and his music. Born To Run was the album that started it all off. I know every word, note and chord change of that 39-minute masterpiece. As a child I was intrigued by this “town full of losers” Bruce sang about, although the stories of escape, love and defeat were slightly lost on me. It ends on track eight with “Jungleland”, potentially one of Springsteen’s most captivating songs to hear live, although you’ll find I’ll say that about the majority. Life as a Springsteen fan has taken me on my own journey. 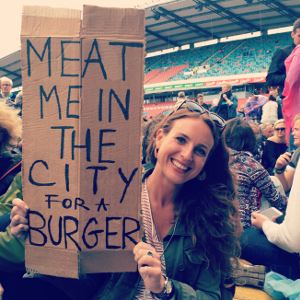 It started with a challenge to myself: could I eat a burger in every city Bruce played? I could certainly try. It’s not always just about the burgers, though: local restaurants and cafés are also where my food-loving heart lies. While I’d love to see Springsteen play in every European city he visits, living in London means it’s often more feasible to travel to Coventry than Copenhagen. Adapting to my surroundings, I’ll swap Italian gelato and cannoli for stodgy meat pies and a flask of tea. Springsteen shows in Italy are inevitably sandwiched between days spent wandering the streets of Rome, tracking down the least touristy spot for an espresso con panna, or soft pillows of freshly made gnocchi, the traditional dish on a Thursday in the city. In Florence I’ll opt for the Italian street food equivalent of a burger – panino al lampredotto – a cheap tripe sandwich (the life of a touring Springsteen fan is life on a budget) known as the “workman’s lunch”. Doused in salsa verde, it’s surprisingly good. Aside from the unrivalled food options and history, the Italian shows are always some of the most intense. Springsteen fans are a dedicated community, but the Italians demonstrate a passion unmatched elsewhere – younger fans who wear their hearts on their sleeves and, combined with three hours of music, they have made for some of my most unforgettable evenings. There was even more magic in the night in Rome in 2013 with the Roma Sinfonietta Orchestra strings section on stage alongside Bruce for a very rarely played “New York City Serenade”. In a dark field on the city outskirts, 30,000 of my Italian best friends and I witnessed a 29-song concert so good that I long to be back there right now, squashed in that hot and humid pit. I still hear the Italian fans’ “Grazie mille!” as Springsteen and the E Street Band left the stage. Me? I’m just wide eyed, red faced and smiling. “Why do you go to so many dates?” I’m often asked, with an underlying hint of “Are you crazy?” Well, I want to see new places and eat new food. And hearing my favourite musician play while discovering an incredible new city is no bad way to spend my time. But it’s also the setlists. With every show you’re treated to around 30 songs. Not the same old songs sung in the same order – there are 17 albums of material to choose from, so Springsteen and the E Street Band become a live juke box, often playing obscure sign requests from the crowd, each show completely different to the last. With an average three and a half hour playing time, Springsteen guarantees value for money of the musical variety. He shows huge respect and gratitude to his fans, continually acknowledging their dedication, and he will never be the type to charge crippling ticket prices for a lacklustre 90-minute gig. So passionate am I (or “obsessed”, to some) that when a tour ends I suffer the inevitable Bruce Blues – the worry of when the next tour will be and the all too familiar “post-tour depression”. I go from a massive high to a serious low. 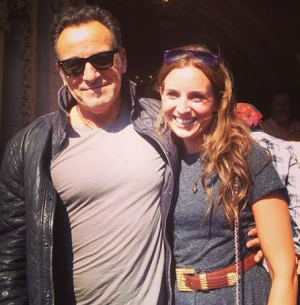 But then you meet other Springsteen fans: people spread out across the world and with whom, regardless of age, nationality or other interests, you have this connection. You are all quite literally singing the same tune. And it’s a great one. This is my story, but I want to hear yours! I love hearing from fellow fans, tell me your burger recommendations, travel stories or best Bruce memory. You can contact me at burgersandbruce@gmail.com, follow me on Twitter, or like Burgers and Bruce on Facebook!